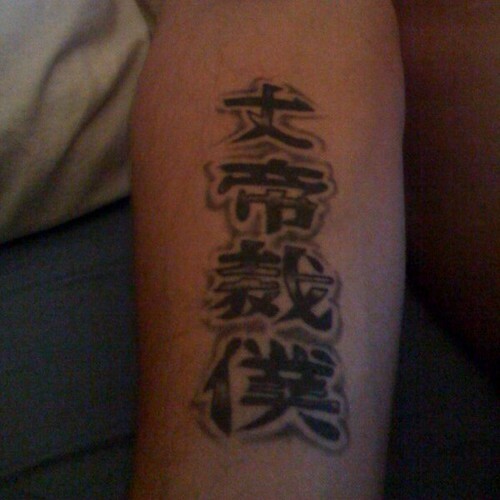 subject: Does this tat really mean this? Love your website and had to ask you. The owner of this tat claims it says "Only god will judge me", is this true? I have heard it means something about being a slave?? The top character may intended to be 大 (large or great), however it is the wrong character, 丈. In Japanese, 大帝 refers to a "great emperor", which does not mean Christian God. 神様 is used when referring to the Christian God. Other words for God are 主 (literally "the Lord") and 天主 ("the Lord in Heaven"). 上帝 is used in Chinese when referring to Christian God. 真主 and 阿拉 typically used for Allah, the Islamic name for God. Funny thing is that 阿拉 means "we" or "I" in Shanghai dialect. 大帝, 玉帝, and 玉皇 are variants of 玉皇大帝, Jade Emperor, from Chinese Taoism mythology. The Goa'uld System Lord Yu from Stargate SG-1 is based on this. Ironically the production company did not cast a Chinese actor for this role, rather Vincent Crestejo. The verb 裁く [sabaku] does mean "to judge" and 僕 [boku] is a common word that Japanese males refer to themselves, meaning "me" or "I". 裁 means "to cut" in Chinese and sometimes it is associated with tailoring. 僕 means only "servant" in Chinese. "The great emperor judges the manservant"
It doesn't really mean what it is supposed to mean, in either Japanese or Chinese.